Signed by Charles M. Duke, crew member (Lunar Module Pilot) of Apollo 16 (with John W. Young and Ken Mattingly). test pilot, and a former astronaut for NASA. As Lunar Module Pilot for Apollo 16 in 1972, he became the tenth and youngest person to walk on the Moon. plus 20 hours and 15 minutes of extravehicular activity. Apollo 16 (April 16–27, 1972) was launched from John F. Kennedy Space Center and was the fifth manned lunar landing mission. The crew consisted of John W. Young as Commander, Ken Mattingly as Command Module Pilot, and Duke as Lunar Module Pilot. by maneuvering the lunar module Orion to a landing on the rough Cayley Plains. and the evaluation and use of Rover-2 over the roughest surface yet encountered on the moon. from a command module during transearth coast (1 hour and 13 minutes). The Apollo 16 mission was concluded with a Pacific Ocean splashdown and subsequent recovery by USS Ticonderoga. This official NASA Lithograph is in fine condition, and is undedicated. 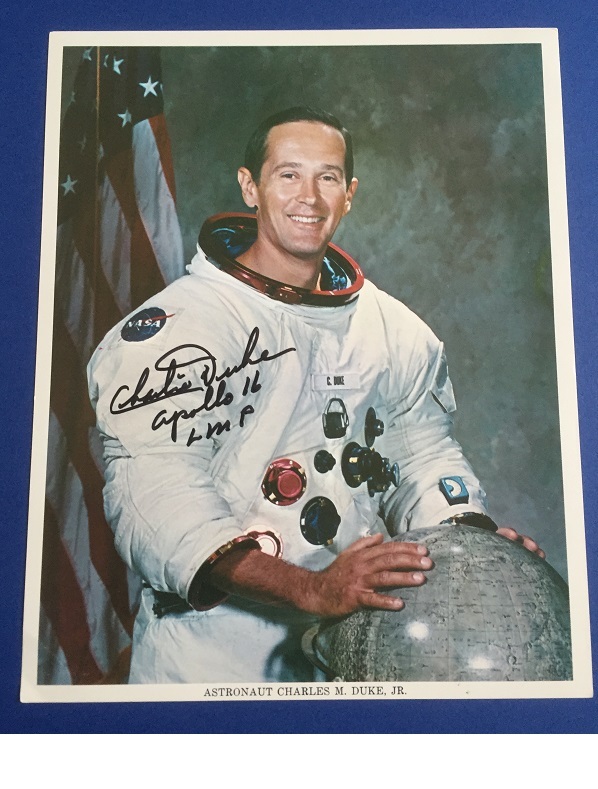 Charlie Duke also adds "Apollo 16 LMP" - Lunar Module Pilot for the historic Lunar landing.